Chic Alert: Designer Handbags at Great Prices! Small handbags became popular a few years ago when the French designer Louis Vuitton introduced, what has since become a classic, the monogram Accessories Pochette. Since then many handbag designers have introduced small bags to use inside a larger bag or alone as a purse or handbag. The adorable Latico barrel handbag pictured here (click image to enlarge) is made from soft perforated leather. The bag has a single adjustable strap, secure zip top and features antique brass hardware. It has a fully lined interior with a zipper pocket. 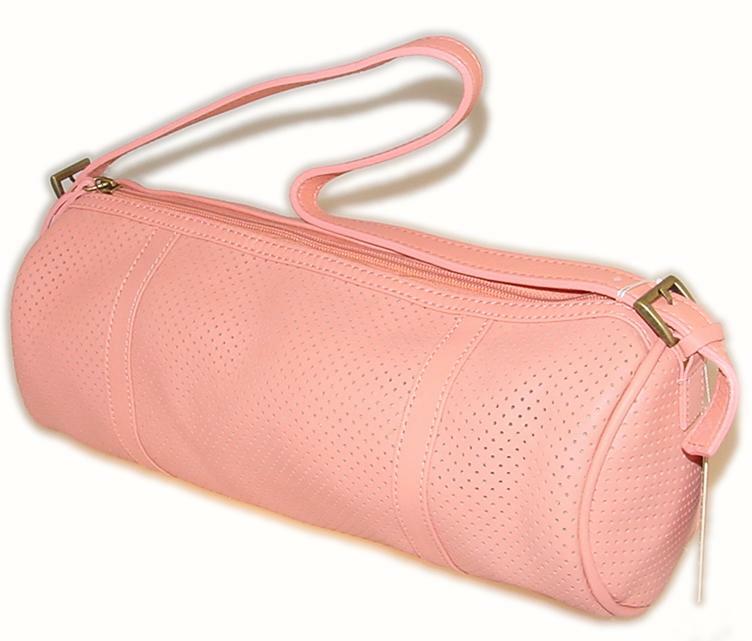 This bag is available in three different colors, pink (pictured here), black and blue. Black and blue have coral pink lining. Pink has khaki lining. Measurements: The handbag measures 13 inches wide X 4.5 inches tall X 4.5 inches deep. You'll find the Latico barrel bag in eFashionHouse's clearance center reduced to $39. That's a 64% saving on the retail price of $109. And there's a matching cosmetic or pencil case on sale for $5 saving you 84% on its $32 retail price. It measure 7 inches wide X 3 inches tall X 3 inches deep and is made from the same soft perforated leather with ultra suede lined interior and secure zipper closure. The pouch also has a narrow wrist strap. There's also a matching crescent makeup case or small clutch measuring 6.5 inches wide X 4 inches tall X 2.5 inches deep and on sale at $5, saving you 83% on it's normal $29 retail price. Now, as well as the above mentioned discounts, you can use Discount Code OFF10 at checkout to claim an additional 10% off all Sale items and Code OFF20 to take 20% off all items in the Clearance Center. For example, this further reduces the price of the Latico barrel bag mentioned above to $31.20, or 71% on its retail price.